Philosophers at the University of Liverpool have developed a smart phone app to test and improve understanding of the great philosophers and their ideas. 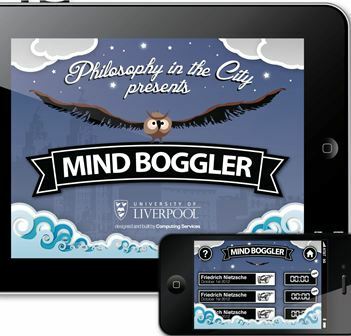 ‘Mind boggler’ is a free fun app which requires users to unjumble a famous philosopher’s quotation against the clock. Successful users can then read biographies and commentaries about the philosopher and the ideas behind the quotation that have been developed by University philosophers. 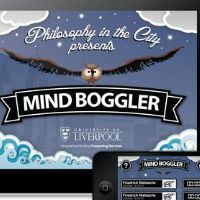 Daniel Whistler, from the Department of Philosophy who helped develop `Mindboggler’, said: “The idea originally came from Professor Gillian Howie and was developed over the last year with the help of the Computing Services Department. “It is designed to test and improve people’s understanding of the philosophical ideas behind these famous quotes. It is part of the our `Philosophy in the City’ programme which links philosophers from the University with the general public and cultural and learning organizations in the region. I think this app by my colleague is brilliant: good fun, addictive, and also educational. And free!